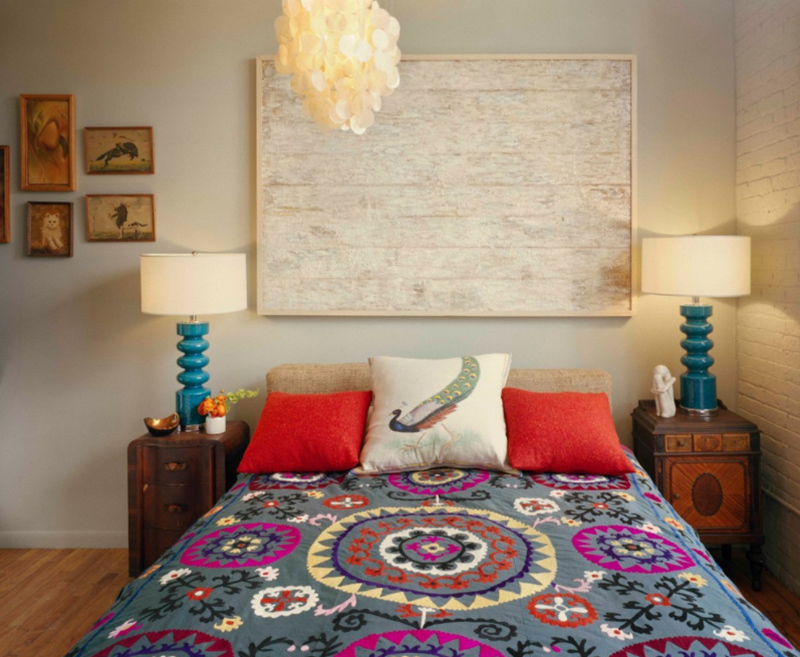 Add zest to your bedroom with a splash of colors in this peacock collection! 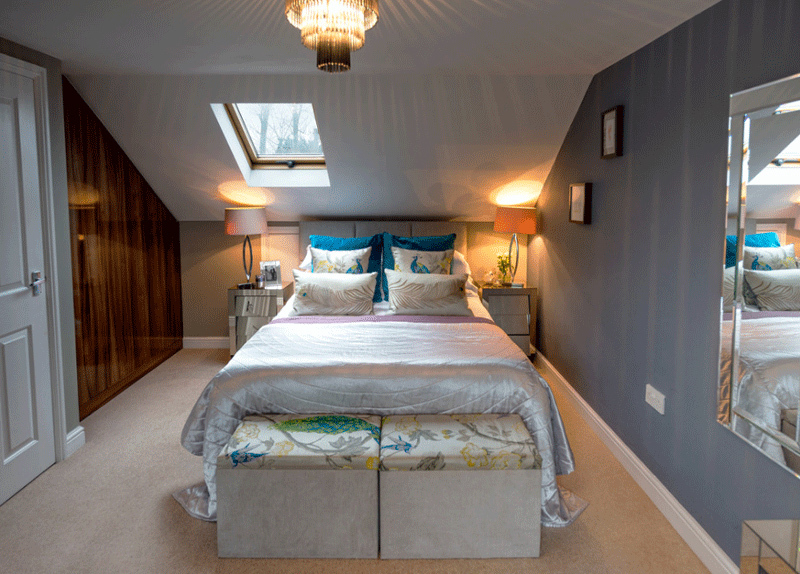 Have you ever wondered why some homeowners go for a specific animal or thing to decorate their bedrooms with? 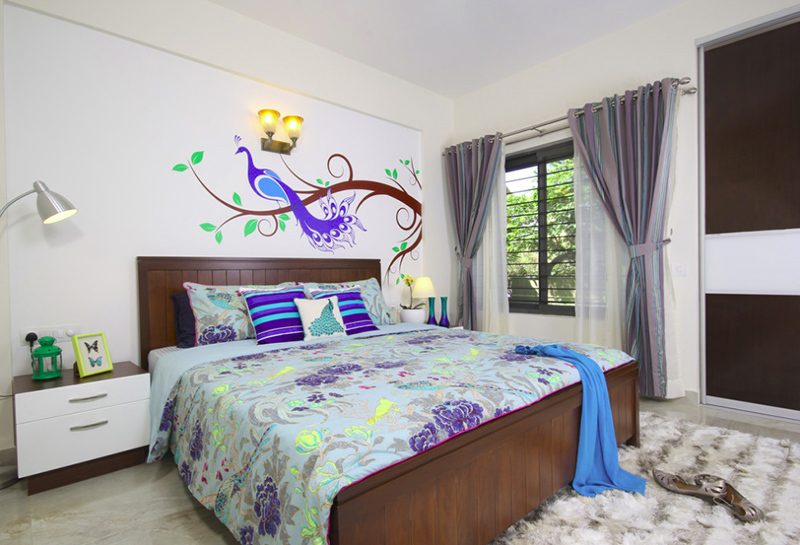 For this list, we have a couple of bedroom designs which chose to have a peacock as the main decor which is sometimes where the overall theme was derived from. Of course, for some of the bedrooms, they just added a single peacock item to accentuate either the bed, the wall or maybe even the floors. Some of the bedroom designs in this list might be too simple for your taste but when you see the peacock item on it, you know that the designer did a good job in making sure that the spaces look absolutely divine! 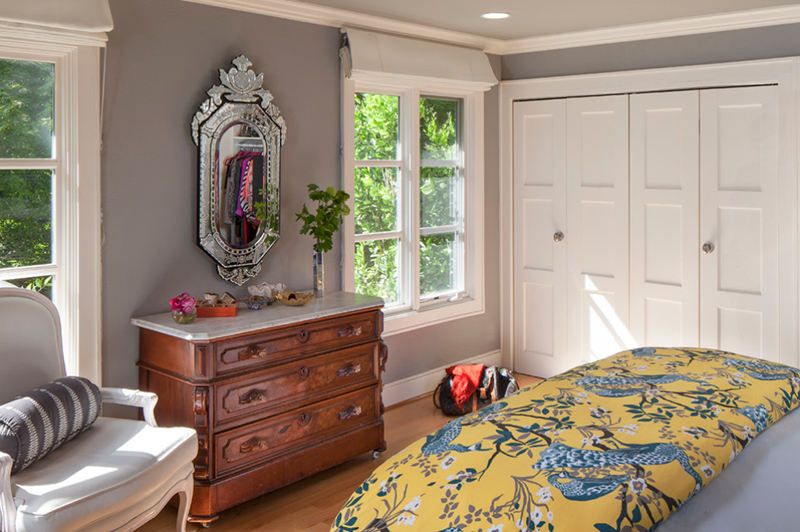 This might just be the prettiest bedroom in this list and I am totally excited that I placed it in the beginning. The large peacock painting on the wall looks so exquisite and expensive. At this rate, it could actually be a wallpaper and I don’t think people would mind because this is just stunning! It brings the room together. Look at the beautiful peacock decal on the wall just above the headboard! It looks really whimsical even when it is simple and a bit cartoonish. The color of the peacock decal match the bedding and pillows and I think this bedroom looks comfy and airy. 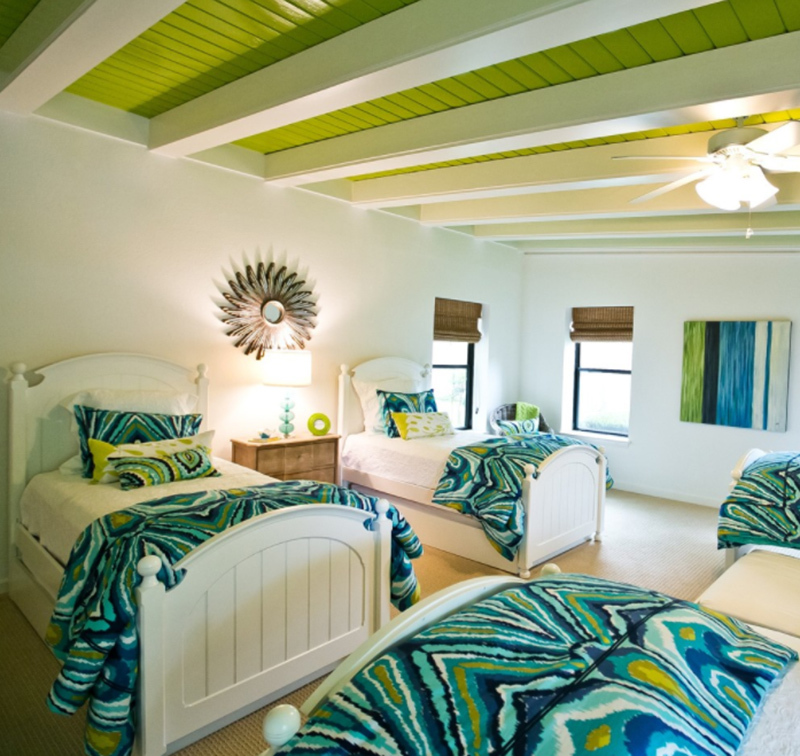 There are no figurines or paintings of peacocks, but the color palette used for the bedding in this bedrooms is that of the colors and prints when we imagine what a peacock should actually look like. 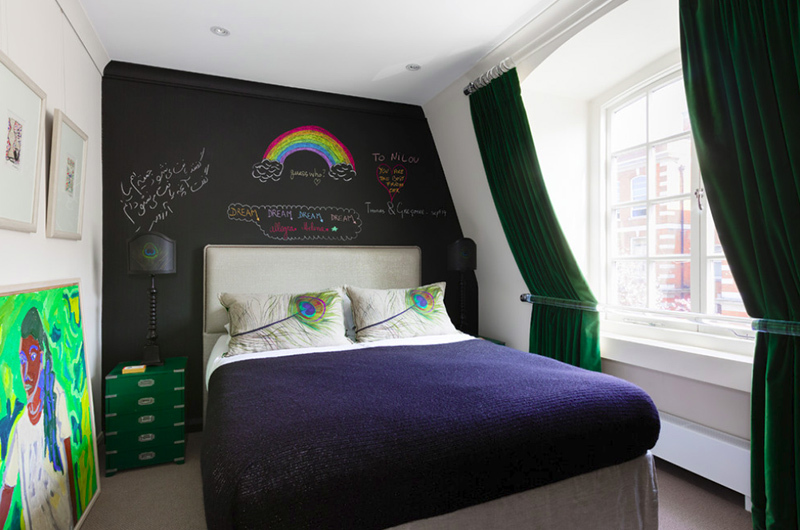 I don’t think anyone would not want to have a chalkboard wall for an accent wall for their bedrooms! For one thing, this is something you can redesign every so often and this is easy to clean and maintain. This is one artsy bedroom and I think the colors that the peacock feather has on it adds more drama to this special bedroom! Adding a large photo of a peacock in your bedroom wouldn’t really hurt, now would it? The strategic location of this large peacock picture sure made this room far more interesting and stunning! 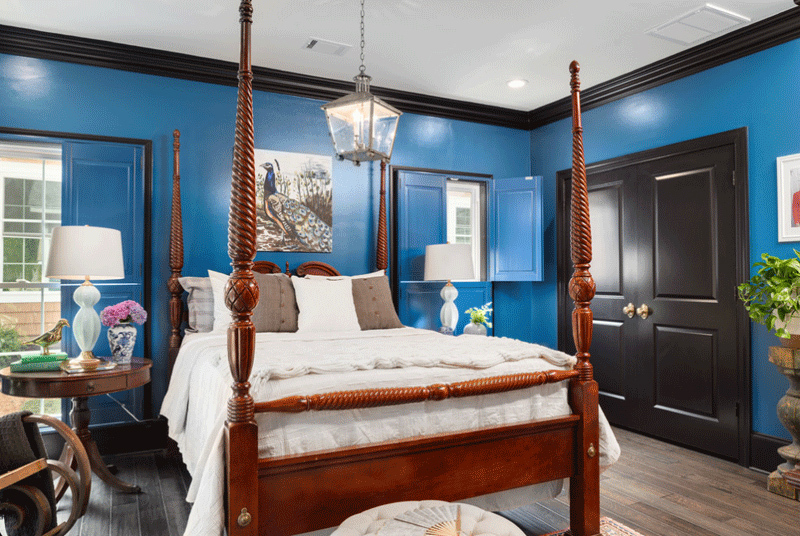 This Colonial style bedroom shows us what exactly to expect in the entire bedroom as is! 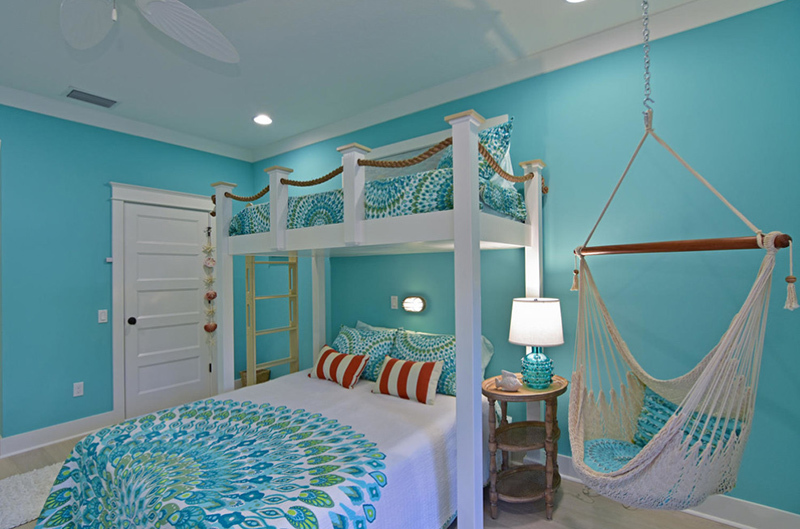 The stunning bed frame, the color chosen for the room and basically everything in it is just wonderful! Adding colorful throw pillows to a space create a different theme for spaces. 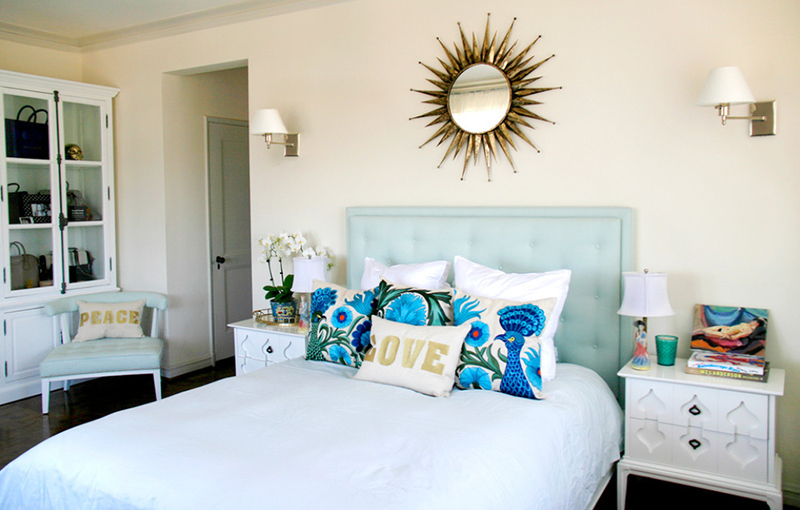 The headboard is tufted but plain, the other pillows are plain as well, and the bedding is plain too, adding the printed pillows on top of all that created a more quirky aura to the space. Even the mirror added an awesome theme to it too. Another bedroom with a pillow in the center of the bed with a peacock print. This is one simple way of adding an accent to your space. It is even interesting for me why they added a framed picture of something really plain – well, it did complement the printed frames just beside it. 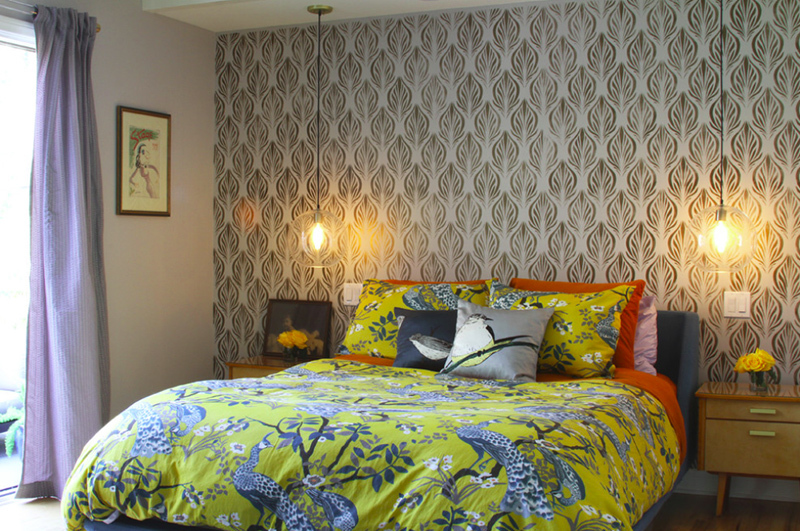 I have seen a portfolio of this project and what I didn’t notice before is the peacock-designed lamp just above the bed! 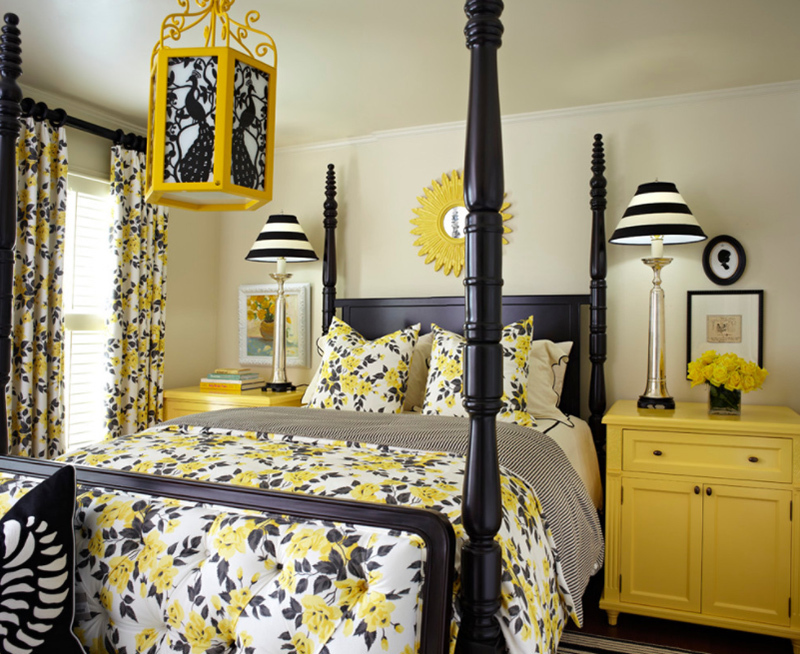 It’s nice that this space is in yellow and black that I didn’t even notice that the design of the lamp is that of a peacock since the bedding have flowers on it, I would have assumed that the lamp would be too. Guess what is peacock-themed in this bedroom? Did you see it? Yea, the carpet! I like how large it is and at first glance, you won’t even totally notice it. 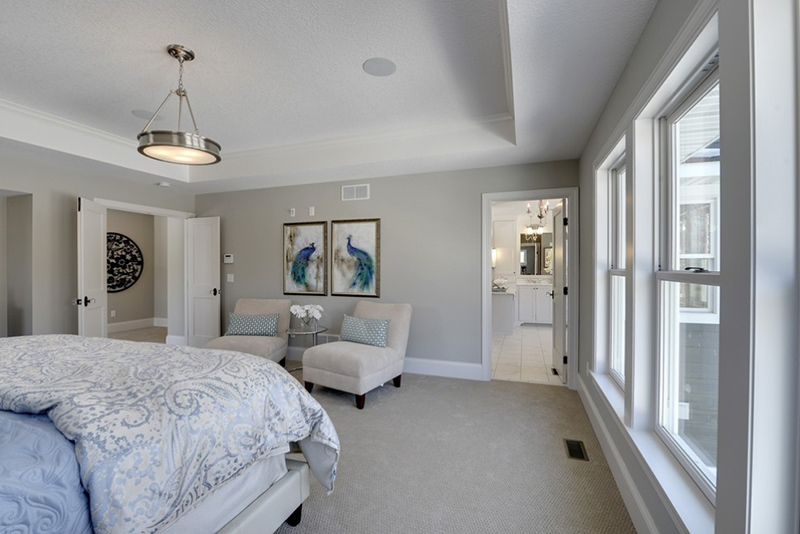 This room’s color palette is all neutral but the addition of the carpet and that accent on the bed added a bit of flavor to this space! Now I think that this bedroom design is just so charming and special! The color combination used for the walls and the bedding for this space is just so pretty, child-friendly and really pretty! I intentionally positioned this bedroom to be in the 12th spot because of its name. It might not be that obvious but the linens on the bed have peacock prints on it and it goes well with the neutral colored bedroom. I love loft spaces and I think it is just wonderful to be able to decorate a loft because it has so much potential! Just like this room which surely left me breathless after seeing how the design concept came about. When I first saw this bedroom, I immediately fell in love with the peacock painting on the wall. It has the right size to accent the top of the bed and it sits in the middle of the room which just looks really pretty. It must not be that much of a peacock, but the picture on the wall sure looks it is and it looks good. It matches the color of the accent throws on the bed. 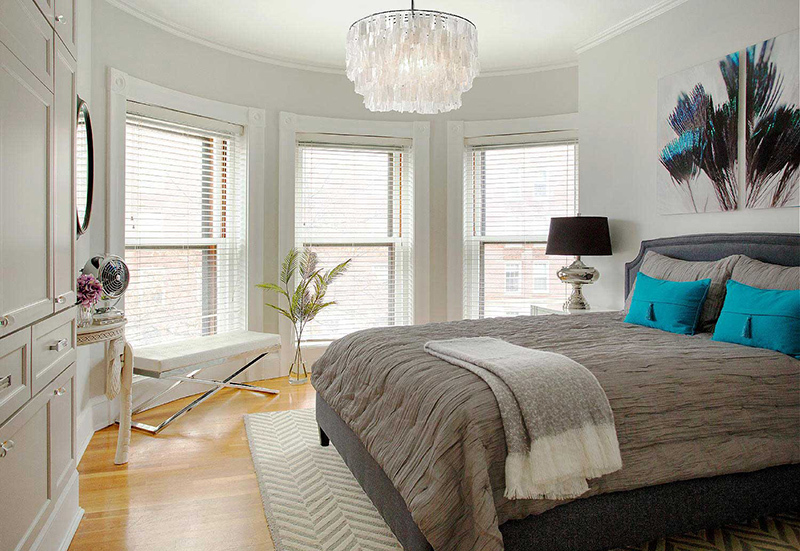 The throw pillows and the picture on the wall sure gives color to this beige and grey bedroom. I think we would be able to see what the peacock themed decor is for this bedroom! I like how subtle its colors are and complement the colors seen inside this room. The table lamps contrast with the walls and I think they are as gorgeous as the peacock figure on the wall! The yellow bedding as this wonderful details that somehow is similar to that of peacocks. 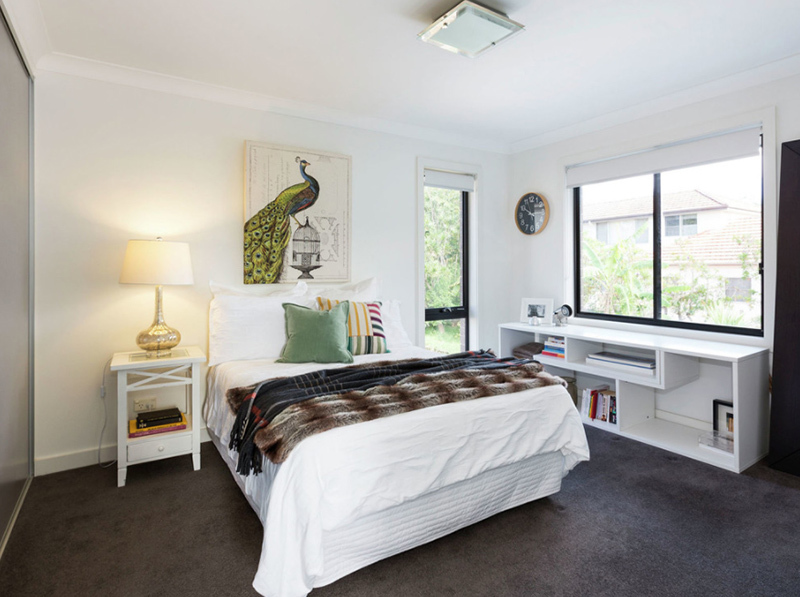 We only see a portion of this bedroom but you know that this space is actually pretty based on the choice of furniture and decor that we can see in this picture. I am a fan of pictures that come in two’s or three’s like this one sitting on the wall just across the bed. The details may not be as crystal clear from this angle, but you know that these pictures are just wonderful. Does this bedding look familiar? It’s somehow similar to one of the bedrooms on this list, only this time we see it in a larger perspective and along with pillowcases! I love its color and how much it complements with the decal on the wall. 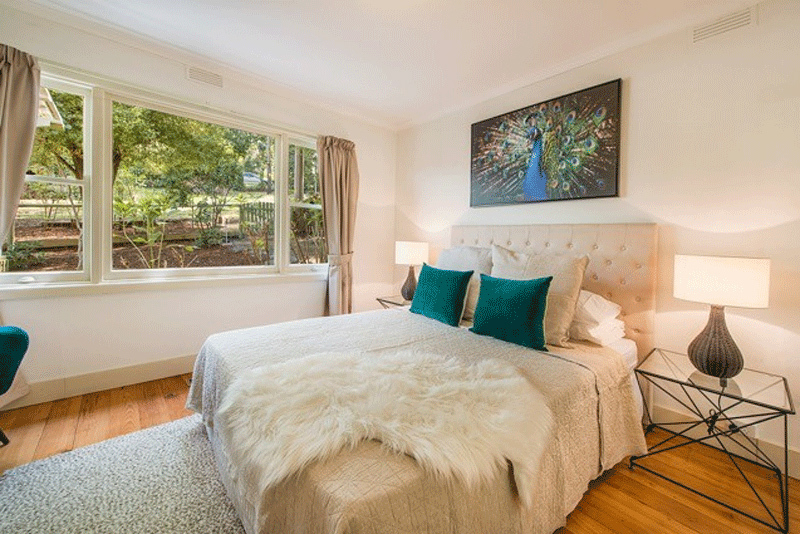 This home in Winecreek this cute bedroom with two double beds that might actually be shared among siblings. The cute arrangement of the frames on the walls look so neat and it seems like artworks or pictures that you make and not buy in stores – personalized as they say; possible personal projects of the people sleeping in this bedroom. Well, there you have it, a beautiful list of bedrooms with peacock decors in them! Specific decorations like this and that of the 15 Awesome African Bedroom Decors is a special kind of design that designers usually encourage to create a more personal space for the clients.